Today, you are a member of... Space Station 77 - You Are A Member! 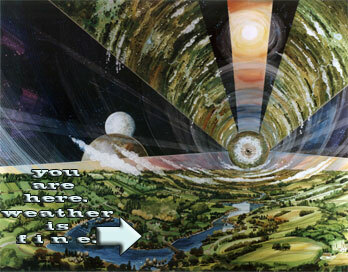 An O’Neill Cylinder is a bitchen’ space station proposed by Physicist Gerard K. O’Neill in his 1977 book, The High Frontier. It simulates gravity with its two counter-rotating cylanders and mimics the rise and set of the sun with long strips of mirrors. With it’s ficticious centrifugal force and reflected lightwaves, such a station can float through space with fertility in spades, supporting farming, manufacturing–even non-motion sick inhabitants. This week you may find yourself barrelling through unknown, uncharted, interstellar space, but rest assured: your O’Neill Cylinder will provide all the gyroscopic compensation you need. And simulated or not, the weather will be damn fine.